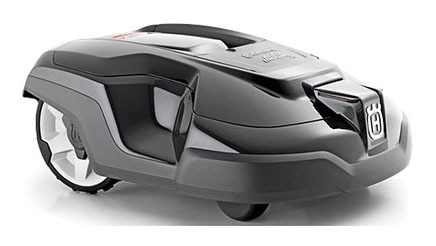 Efficient 4-wheeled robotic mower for larger and more complex grass areas. Suitable for medium sized areas up to 1000 m² and can also handle slopes with an incline of 40%. Smart technology automatically guides the robotic lawn mower through narrow passages. The intuitive menu system allows personal settings for when you'd like the machine to mow. Snap-covers in different colors are available as options. MANAGES SLOPES UP TO 40%: Large coarse-tread wheels provide excellent traction even if the surface is slippery. The mower handles slopes up to 40%. THEFT PROTECTION BY ALARM/PIN CODE : Different level theft protection for high security. If the mower carried away a high-sounding alarm starts and can only be deactivated with the mower's unique PIN code. Typical charging time - 60 min. Typical mow time on one charge - 70 min.